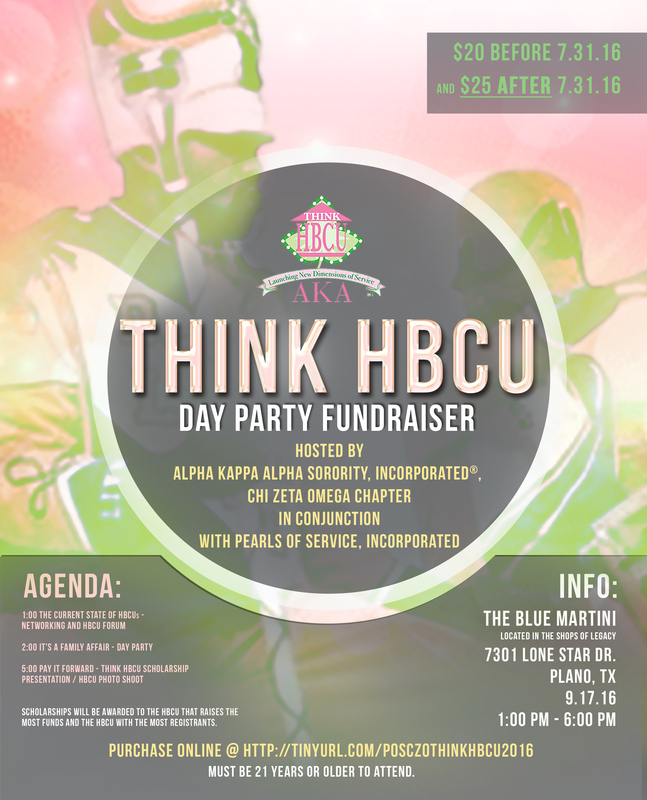 As part of an ongoing commitment to provide financial assistance to Historically Black College and Universities (HBCU’s), Alpha Kappa Alpha Sorority, Incorporated® – Chi Zeta Omega Chapter will host it’s third annual Think HBCU Day Party Fundraiser. Support of HBCUs will be a priority as Alpha Kappa Alpha launches a national campaign, Think HBCU to highlight HBCUs and their contribution to the sorority and society. Through education, engagement and advocacy, HBCUs will be showcased as a critical venue for moving students to and through college. The Think HBCU Day Party Fundraiser will be held on Saturday, September 17, 2016, 1:00 p.m. – 6:00 pm, at Blue Martini located at 7301 Lone Star Drive, Plano, TX 75093. 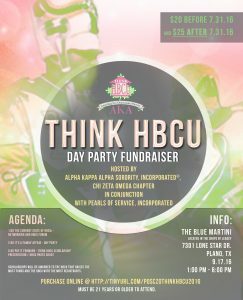 During this Think HBCU Day Party Fundraiser, a scholarship will be awarded to a local HBCU alumni chapter that raises the most funds and a scholarship will be awarded to a local HBCU who has the most registrants. In 2015, Grambling State University was awarded a $4,500 scholarship. Your support will help strengthen the financial disparities affecting our HBCUs.